This past weekend I had the honor of assisting at the IKFF Kettlebell Teacher Certification in Dallas, TX. It was a great time in both instructing and being instructed. I always love attending these sorts of things because I am surrounded by the most talented and amazing people. 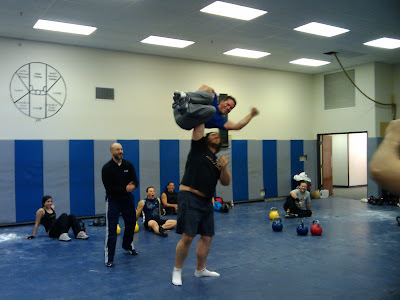 A lot of the fellow Kettlebell Coaches and attendees I met were folks I have communicated with online via email as well as on such websites as Facebook, Myspace, Twitter, blogs, etc. It is always really cool to meet them face to face and get to know them better in an element we all love. Among the many people who I worked side by side with this weekend there was one person who performed some exceptional feats of strength and just plain old really cool stuff. 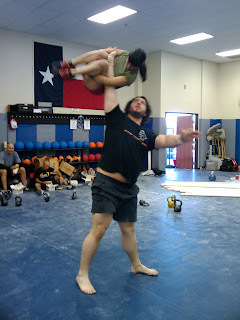 He is none other than John Wild Buckley of the Orange Kettlebell Club or OKC. He's an enormous man, ok well it doesn't take much to be enormous compared to my size of only 5'6", but he is actually pretty big at 6'6" and over 300lbs. The man dwarf's Paul Bunyan by a heck of a lot! In case you don't know who Paul Bunyan is I have enclosed a video so you can know. What is even cooler is what else he did at the Dallas cert. After performing one of his trademark Nazo Presses he decided to step it up to the 80kg "Cotter Press". This is the latest and greatest pressing endevors and methods in Girevoy Sport training. Anyone who's anyone is doing it and very cool if they can. And John is definitely the coolest of the cool for being the first to "Cotter Press" the one and only Steve Cotter. For a full walk-through tutorial on the ins and outs of the Cotter Press you gotta go to either the OKC and/or the IKFF for details. In the meantime take a peak at the first images ever shown in public known to man.